$1.50/1 Clorox 2 Coupon + Deal Ideas! 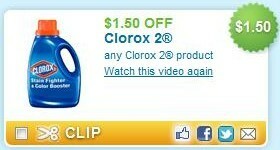 Hurry over to Coupons.com and get this nice $1.50 off 1 Clorox 2 coupon! NOTE: You'll might have to watch a short video before you can print. Just click the "Watch this video" link that's on the coupon.